The Arched Card Holders look great when folded closed or open as a desktop display. The classic clean lines make this Card Holder an impressive gift. The Maple Arched Card Holder reveals a rich brown tone when laser engraved. Make use of the Wood Thins or LaserLIGHTS for a truly outstanding product. 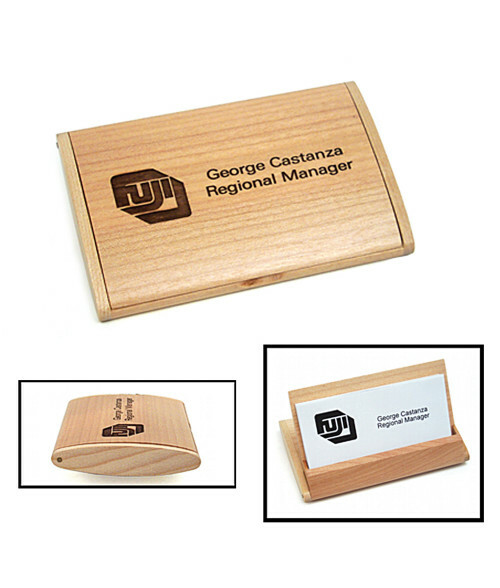 The Maple Arched Card Holder will hold approximately 15 business cards. 1-3/4" x 2-3/8" x 2-9/16"
2-1/2" x 2-1/2" x 4"
2-1/2" x 2-1/2" x 4-1/2"
21" x 21" x 23"
4.1" x 4.1" x 13.8"
4.125" x 4.125" x 14"
7-3/4" x 4-3/8" x 7"
7-3/4" x 6-1/2" x 7"
7-7/8" x 5-1/2" x 7"